Check Out How To Turn Your Android Phone Into An iPhone X! The popular multinational company Apple recently unveiled their grand handset iPhone X. Apple has claimed it to be the best iPhone ever. The iPhone X is a sky-high priced device which is difficult to afford by everyone. So today we will be discussing that if at all you are not able to purchase the iPhone X you can easily turn your Android device into iPhone X. But how? 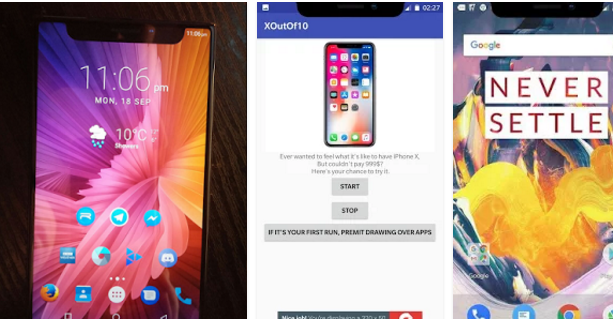 Recently, a developer who has an undercover name Idoidea developed an application”Xoutof10” which can turn any Android device into an iPhone X. The application, when installed on the Android device, creates the iPhone X’s camera cutout in the Android smartphone. The application “Xoutof10“ creates a black space around the top of the screen. The black space is similar to the iPhone X’s sensor packed notch. The Android user just needs to download and install the app XOutOf10 from the Google Play Store. This app is only compatible with smartphones working on Android Marshmallow and above. Once you download the app just click on Grant the permission to “Permit Drawing Over Apps”. However, the Android Oreo users will not be able to access the application because notch will be hidden while dragging down the notification panel. Next Post:Google to Buy HTC’s R&D Team for a Whopping $1.1 Billion!